Multi-Purpose Stadium Makes 24/7 Communication Possible with Motorola Solutions –Motorola, Inc.
City of Champions Stadium: Inglewood, Calif. When the new home for the Los Angeles Rams and Los Angeles Chargers is completed in 2020, it’s projected to be the world’s most expensive stadium. A whopping $2.6 billion later, the arena will be built with more than 36,000 perforated aluminum panels that are specially designed to work with the Southern California climate, and therefore create the effect of being outside. It also aims to have the most unique video system in the NFL. Nicknamed “Oculus,” an oval-shaped, two-sided board will hang from the roof of the facility, and it will be 50 feet tall and 120 yards long. This multipurpose complex will also feature a performing arts center, a hotel and even a lake. Golden 1 Center: Sacramento, Calif. 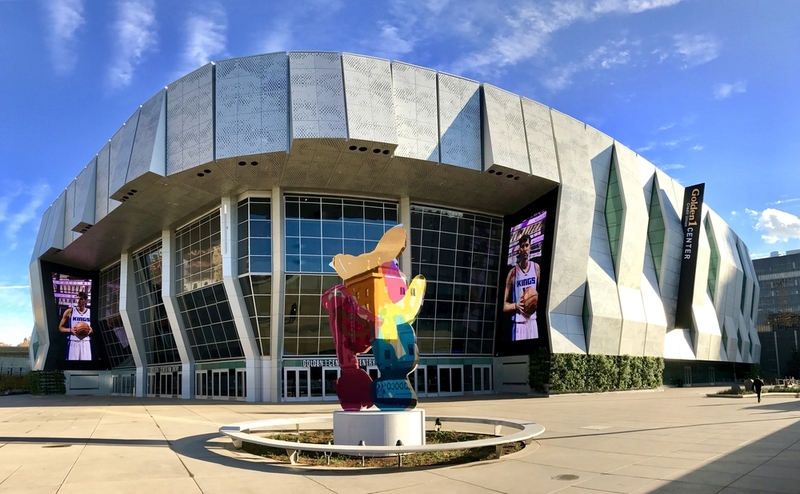 When this indoor arena in downtown Sacramento opened in 2016, it was touted as “the world’s most connected indoor sports and entertainment venue.” The free Wi-Fi connections at the arena are said to be 17,000 times faster than the average home network, allowing for instant uploading and sharing. It also includes the largest screens in the NBA, delivering a “4K Ultra HD” broadcast on massive 44-by-24-foot boards. David Beckham’s Major League Soccer Stadium: Miami, Fla. This South Florida super venue won’t have a parking lot. Yes, you read that right. This 25,000-seat Major League Soccer stadium is coming at a time when eco-friendly technology (and being a die-hard MLS fan) is more than just a trend in the U.S. The stadium is expected to open in 2021, and you can get there via Metromover, Metrorail, water taxi or maybe even a dinner-cruise boat down the Miami River. Raiders Stadium: Las Vegas, Nev. The Oakland Raiders have been approved for a new home on the Las Vegas strip, making it Sin City’s first NFL team. Its new stadium is a work in progress, and it’s attracting a lot of positive attention for bringing a futuristic feel to the strip. There will be a massive retractable wall of windows overlooking the city, as well as a giant video screen on one side of the stadium for tailgaters to get in on the fun. And keeping in theme with the town, fans will be able to legally place bets on their phone from the comfort of their seats. Levi’s Stadium: Santa Clara, Calif.
Levi’s Stadium isn’t a new venue, but it’s taken steps to make a technological name for itself. The home of the San Francisco 49ers is in the heart of Silicon Valley — the mecca of the modern tech world — so it’s only appropriate that the team would have one of the most high-tech sports venues around. One of its biggest draws is allowing 70,000-plus fans to connect to Wi-Fi and 4G, giving them the chance to have an integrated and personalized in-stadium experience in the palm of their hands. Designers laid out over 400 miles of cabling to connect Wi-Fi routers and 1,200 antennas, amounting to 40 times more internet bandwidth capacity than any known U.S. stadiums. Spectators can download an app to watch replays during downtimes, guide them to a bathroom with the shortest line and even order food and drinks right to their seats. While these venues are setting the stage for a new era in stadium technology and advancements, this is hardly a comprehensive list. New plans for multimillion-dollar building projects are appearing all the time. Be sure to keep an eager eye out for high-profile renovations of arenas looking to dive into the future.